No fewer than four new models join the ranks of the DIMIER Collection in 2014. The celebrated arrival of the Calibre Specialités Horlogères which powers the Récital 12 and Récital 15 has in no way stolen the thunder of other collections or grand complications, which are of course a highlight of the year for collectors of fi ne watches. 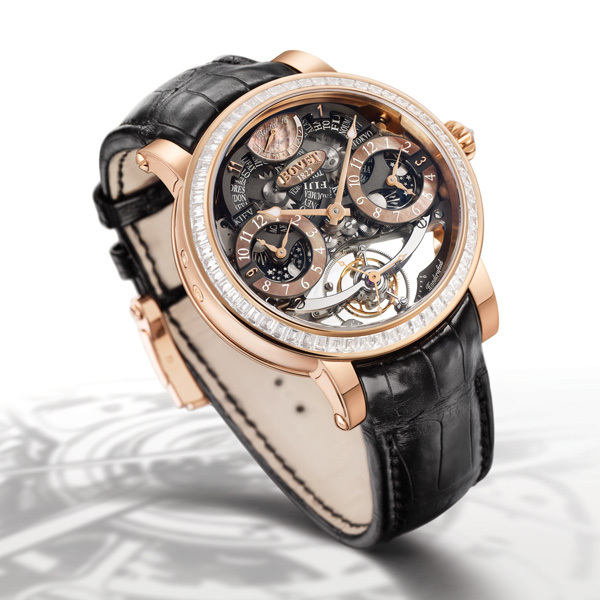 Proof of this is the Récital 16 Triple Time Zone Tourbillon. The 595 components of its movement were manufactured, decorated and assembled individually, with even the simplest of them requiring a minimum of ten hours’ work. 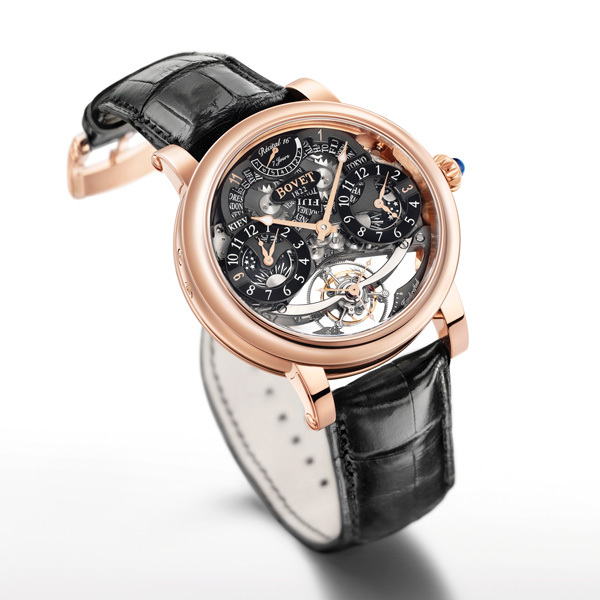 The tourbillon cage alone comprises 68 parts. Of these, the balance- spring is the true heart of the movement. Its traditional manufacturing requires cutting-edge equipment, perfect mastery of nanotechnologies, and above all a level of experience and know-how possessed today by only a handful of artisans. Like all movements manufactured by DIMIER 1738, the balance-spring of this tourbillon was designed in-house. It allows oscillations of the balance-spring to be maintained at a frequency of 21,600 V/h. The eight hands and four discs featured on this grand complication were no impediment to legibility for the artisans of the Manufacture de Haute Horlogerie Artisanale , Dimier 1738. Brilliantly positioned, the numerous indications follow a logical pattern ensuring optimal symmetry, legibility and aesthetic prowess. The method followed by Pascal Raffy and the design offi ce team was once again applied to the development of this timepiece. The exact position of each indication was therefore determined before designers began developing the most complex mechanisms and the diffi cult arrangement of their centrings. To monitor all parameters of this intricate equation while increasing the density of mechanisms on the reduced surface of a three-quarter plate, the Manufacture’s design offi ce relied on the sound judgment of each artisan, working with dimensions and tolerances frequently expressed in microns. 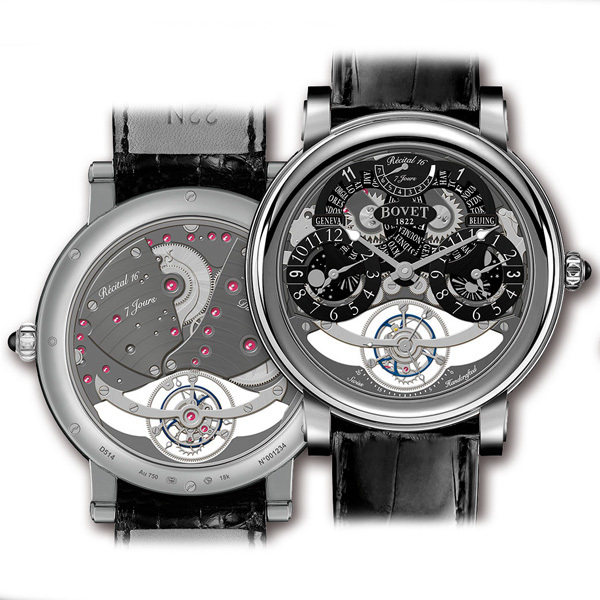 The three time-zones of the timepiece occupy its horizontal axis. Prominent, the local time-zone occupies a central position on the surface of the movement. On either side are displayed the other two time-zones, with hours and minutes. Each is accompanied by an indispensable day/night indicator and a sapphire disc with 24 cities, making it possible to display simultaneously three selected times from any time-zone around the globe. If the mechanisms of this Récital 16 are so complex, it is fi rst and foremost because they meet Pascal Raffy’s wish to provide fundamentally useful information. Since the latter includes no fewer than three time-zones, the power-reserve and seconds indicators occupy clearly distinct positions at 12 o’clock and 6 o’clock. Contrary to most grand complications whose mechanisms function occasionally, virtually all components of the tourbillion movement with triple time-zone are perpetually in motion. Despite the hundreds of gear-trains needed to drive the movement, despite the thousand pivot points this represents, the two barrels guarantee a power-reserve of seven days. The usefulness of the power- reserve indicator in this instance is self-evident. As is customary in the collection, the steel of the mechanisms that give the timepiece its unique character, fi nely chamfered and polished by hand, is revealed by creating an orderly and uncluttered space. The four staged horns of the case, the positioning of the crown at 3 o’clock and the generous smile of the tourbillion cage bars make it clear that the Récital 16 is a member of the DIMIER collection. At the summit of their art, the dial-makers of the Manufacture de Haute Horlogerie Artisanale DIMIER 1738 constantly push back the boundaries of perfection, regardless of the style of interpretation or the materials used. The index applied at 3 and 9 o’clock are lacquered in black as they report to both the central and secondary time zones. 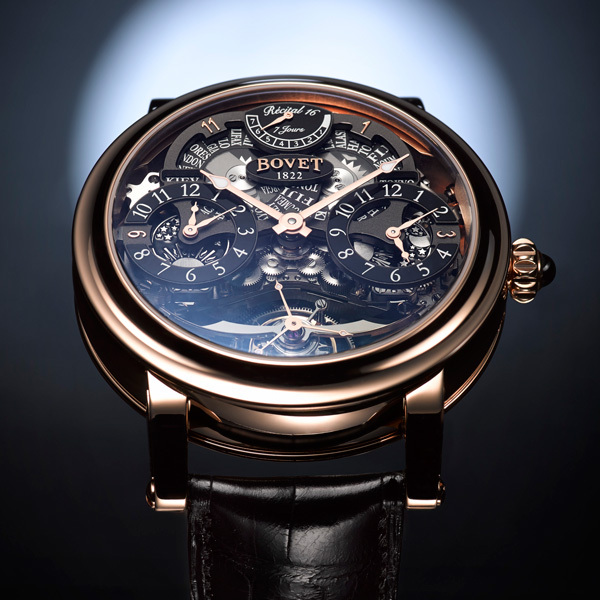 With the dial of the Récital 16 , and indeed all timepieces manufactured for this new 2014 collection, the talent expressed by dial-makers and watchmakers alike will give the year a special signifi cance in BOVET’s history. The dial of this timepiece alone is worthy of the status of watchmaking complication, in view of the complexity of its development and manufacture and the sum of its technical and aesthetic constraints. 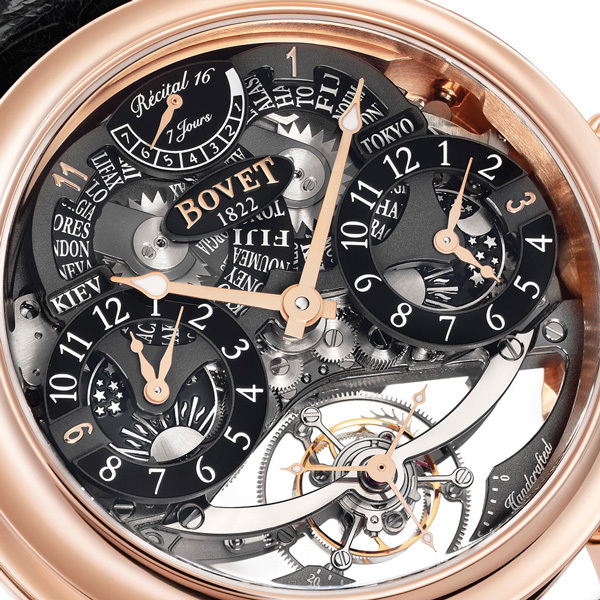 Avant-garde in its design and technical functions, it has been manufactured in accordance with the decorative arts of fi ne watch making and the emphasis on quality praised by BOVET for 192 years.